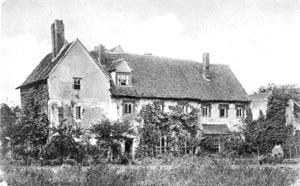 Beeleigh Abbey was founded in 1180 for Canons of the Premonstratensian Order who migrated from Pardon on the western border of the county, now part of Harlow New Town. It was established on land granted to the canons by Robert de Mantell, Lord of the Manor of Little Maldon and Sheriff of Essex. The church and cloister buildings developed on this site on the banks of the river Chelmer. An abbey farm was established and the canons also took ownership of a nearby existing watermill. The Abbey was issued with a Royal Charter by King Richard I in 1189 (later confirmed by Edward III in 1364) and patronage of the Abbey passed to the powerful Bourchier family in 1365. 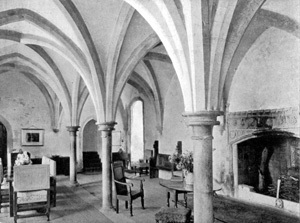 Beeleigh Abbey was closed in 1536 under the Act of Dissolution, having an income of just £157 per annum, with everything of any value being removed and sold. Demolition of the entire church and parts of the abbey took place and the Bourchier tomb was dismantled and taken to Little Easton parish church. In 1540, Henry VIII granted the remaining buildings and lands to Sir John Gates of High Easter and Chancellor of the Duchy of Lancaster for the price of £300. He, however, was beheaded on Tower Hill London on August 22 1553 for supporting the cause of Lady Jane Grey. Gates had already disposed of the Abbey to William Marche in 1546 and he to Thomas Francke the younger in 1547. 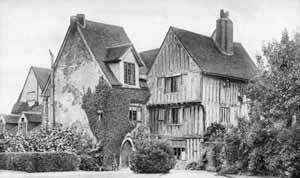 It is possible that it was one of the Francke family who built the present red brick Tudor wall which surrounds most of the premises. 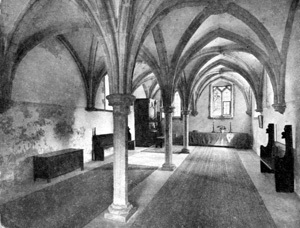 The Abbey Church had been destroyed at the Dissolution, but the Chapter House and the Calefactory remain. They date mostly from the second quarter of the 13th century and their vaulted roofs are supported by slender columns of Purbeck marble. The carved stone fireplace of the 15th century in the Calefactory or Warming House has at its head a range of angelic figures playing early musical instruments. The Tudor timber framed wing was built after the Dissolution. During the 18th and 19th centuries the Abbey was a farmhouse and was not restored until the early 20th century by the architect Basil Ionides for Captain F W Grantham who had leased the Abbey from the the Baker family of Hockley in 1912. Grantham embarked on a programme of restoration including the building of modern living accomodation. The gardens were laid out by Wykeham Chancellor in the 1920s. In 1943, Beeleigh Abbey was purchased by Mr W A Foyle of Foyles Bookshops of Charing Cross Road. 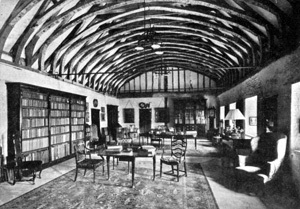 Mr Foyle retired in 1945 but continued with his antique book business turning the Abbey dormitory into a huge library which eventually contained over 4,000 books. The collection was sold for £12.6 million in July 2000 after the death of his daughter Christina who had taken over the Abbey on the death of Mr Foyle in 1963. Beeleigh Abbey is still in private ownership and remains closed to the public although the gardens and grounds will be open for a few days each year. The present owner, Mr Christopher Foyle, grandson of Mr W A Foyle, is continuing with the restoration work on this wonderful old building. Visitors to Beeleigh Abbey often ask if there is a written account of its' history readily available, but up till now there has been only a little booklet dating back to 1962, plus a popular specific study of the archeological excavations there 10 years ago entitled 'Beeleigh Underground' , both of which now have only a very few copies remaining. Now Christopher Foyle has just fulfilled a long term personal ambition to produce a new book about his home in Maldon, which is currently going to print. It gives the detailed history of the place, its previous owners including his own family, and a description of the buildings and their gardens. Some 98 pages long it is beautifully illustrated throughout and easy to read. Included in the accounts are medieval royal visits, the dissolution and partial destruction of the monastery, a local saint, the beheading of a previous owner caught up in Tudor politics, a poisoned abbott, buried treasure, ghosts and much more!